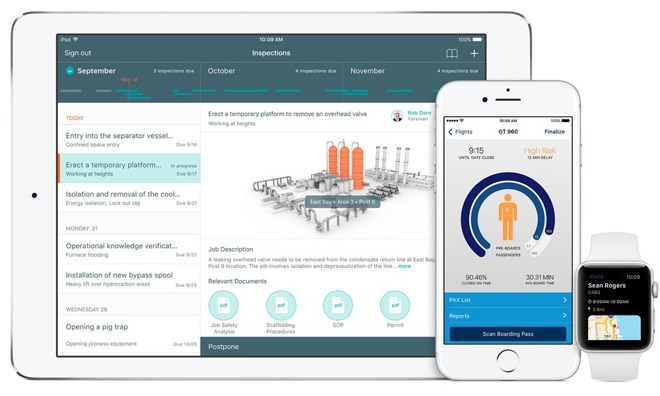 Japan Air Lines (JAL) and Finnair will be using Apple iPhone and iPad Pro with new IBM apps designed to improve their aircraft maintenance in a new collaboration with the Mobile First program that builds custom iOS apps. IBM stated that with its new iOS apps, JAL's "aircraft engineers have access to tools and processes that allow them to expedite repairs and modifications to the aircraft." The two new IBM MobileFirst for iOS apps, Inspect & Turn and Assign Tech, "eliminate manual-based processes and reduces time spent on preparing and reporting technical issues," the global consulting company stated. "Aircraft engineers at JAL are now able to focus on identifying higher-level issues by saving time on routine maintenance checks," the company said. "Engineers who inspect the aircraft can now check the estimated arrival time, review the most up-to-date flight schedule and be alerted of any gate changes, without having to contact the office. Instead of reporting the progress of tasks via radio, engineers can now share aircraft preparation status for a flight immediately using iPad and iPhone." IBM's new partnership with JAL comes just two weeks after the firm signed a similar deal with Finnair, Finland's largest airline, to build iOS apps that streamline and modernize technical operations and customer experience. A report by Matt Kapko of CIO noted that Finnair is working with IBM's "MobileFirst for iOS Garage," a collaborative development hub for iOS enterprise apps. Following its landmark 2014 partnership with Apple to develop custom apps for enterprise clients and sell Apple's iOS devices and support agreements, the global consulting company now claims the world's largest concentration of developers versed in Swift, as well as designers, integration experts and enterprise iOS consultants. Finnair is the first client to participate in IBM's new "Mobile at Scale for iOS" model for design and development. Announced in the fall, the program is designed to accelerate development and increase the efficiency of iOS apps, with a goal of reducing development costs and time by up to 25 percent. Raimon Christiani, global head of IBM's travel and transportation unit, told CIO that its partnership with Finnair was aimed and demonstrating how iOS can "achieve digital transformation" for large enterprises. "Rather than using mobile in silos," Christiani stated, the airline is looking to IBM's industry expertise and solutions to digitize the entire airline."